You are currently browsing the Gluten Free For Good blog archives for September, 2007. I’m at the Celiac Sprue Association national conference in Tucson, Arizona. Things will be in full swing tomorrow and I’ll keep you posted as to what’s going on. There are four days of great speakers scheduled; from Lee Tobin at the Whole Foods Gluten Free Bakehouse to Stefano Guandalini, gastronenterologist and international celiac specialist from the University of Chicago Hospital. Lifestyle changes, gluten free baking, what’s on the horizon, nutrition therapy, new products, updates on research, and on and on. I’ll fill you in as long as I can manage my internet connection. It’s a bit sketchy at the place I’m staying. Otherwise I’ll put together a detailed blog entry when I return. I love salmon. It’s high in omega-3 fatty acids, which are anti-inflammatory and also help protect against cardiovascular disease (among other things). Wild salmon is a better choice than the farmed versions for a variety of reasons (I’ll spare you the details and save it for later). According to the Marine Stewardship Council, wild-caught salmon from Alaska is the best choice as it is certified as sustainable. 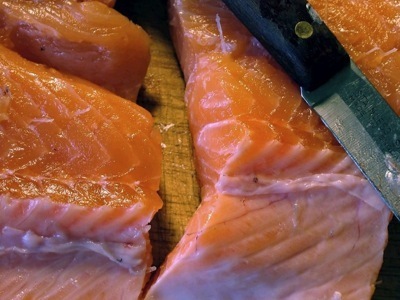 Market names for these choices are Coho, Sockeye, King, Pink and Red Salmon. For more information on the importance of making sustainable seafood choices, check out the Monterey Bay Aquarium. You can also download pocket-sized regional Seafood Watch Guides to keep with you, so you don’t forget which are your best choices and which fish to avoid. For example, scientists agree that we are now fishing the last 10% of the Atlantic Cod population. Avoid Scrod, Whitefish and Atlantic Cod for that reason. Educate yourself so you can support sustainable options and avoid fish that are declining in numbers. Serve with roasted Yukon Gold potatoes and a side salad. YUM! There are so many naturally gluten-free and healthy food options that it really doesn’t have to be that hard to eat wonderful and nourishing meals if you have celiac disease. And while I’m on the subject, I intensely dislike the word disease in connection with celiac. Condition, circumstance, situation – there has to be a better word than disease. Can anyone come up with one? Something a little more uplifting and positive. If you were never exposed to gluten (ever), you would never end up with celiac disease (ever), so let’s call it something else. I think I’ll start calling it the “celiac phenomenon.” Or as my son’s girlfriend says, “that yak thing.” Give it some thought. We need a new name for this, something more optimistic. Okay, back to taking charge of your gluten free lifestyle and making it a nourishing and savory one. Nourishing, savory, and gluten-free go together quite well. It does take some time and effort though. No time? Yea, I know, it’s not easy, but once you get in the swing of things, it’s not that bad. And it’s actually a lot of fun, but you do have to do your share of of up-front work to stay off the nutritional slip and slide. Prepare things ahead so you don’t get stuck munching on less healthy choices out of desperation. Like a bag of potato chips or gluten-free, prepackaged cup cakes. You’ve heard this before, but just because it says gluten-free doesn’t mean it’s healthy. This spinach salad takes very little time to prepare, is a nice change from typical dinner salads, and is packed with high-end nutrients. Add some wild rice on the side and you have a whole meal. I’ll start with the over-the-top nutritional values provided by this Popeye-sustaining vegetable. 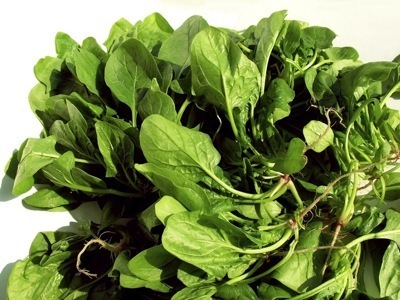 First off, one cup of fresh spinach provides a whopping 1110% (no mistake, that’s thousand) of the daily value of vitamin K, 294% of vitamin A, 84% of manganese, 65% of folate and 35% of iron. It also has plenty of vitamin C, B2, calcium, potassium, B6, dietary fiber, protein and on and on. Even some omega 3 fatty acids. This is all packed into one cup of spinach, which is a measly 41 calories. Lots of bang for your buck! Posting an entire segment on salt may seem a touch strange, but I’m curious about all the flavoring additions to cooking and baking and salt is one of the most important ones for seasoning foods. As a food preservative, it played a contributing role in the development of civilization and was a very precious commodity. History even suggests that Roman soldiers were paid with salt. The term salary derives from the Latin word sal or salarium, hich translates to salt. Wars were fought over salt. Weren’t they? Wasn’t there the War of Salt, or the Seven Year Salt War? Maybe not, but it was definitely an important part of early trade and commerce. It’s even mentioned several times in the Bible. Don’t ask me where. Back to the basics. Salt draws moisture out of food so bacteria can’t grow, hence it’s evolvement as a food preservative. Today it’s used heavily in processed foods; it adds flavor, reduces dryness in crackers and snack foods, increases sweetness in cookies and cakes, and even helps mask the chemical and metallic aftertaste in canned sodas and soft drinks. Yuck. Most people get more than the recommended 1,500 to 2,000 milligrams of sodium per day because of the amount of processed foods they eat. As always, minimize processed and refined foods and go for whole, nutrient-dense choices instead. 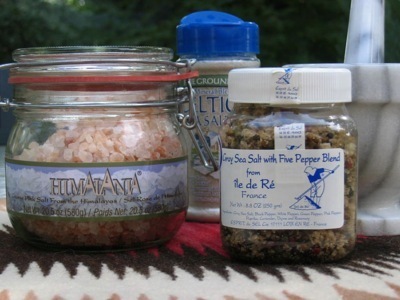 Sea salt and salt mined from the earth are harvested from the ocean or remnants of ancient oceans and salt lakes. These versions are evaporated and sun-dried and contain trace elements that are missing from fully refined or chemically manipulated table salt, but also don’t contain the iodine levels that are added to table salt. Sodium (the primary constituent of salt; either version), is one of the electrolyte minerals we need for normal cell function. But we’ve all heard that overuse of salt can cause kidney problems and high blood pressure, so balance and moderation are important. I prefer Celtic Sea Salt as it has a mellow taste and is more flavorful than commercial salt, which tastes a bit “chemically” to me by comparison. I also much prefer the texture of sea salt. The fact that it is hand-harvested and solar evaporated (sun dried) using traditional methods is appealing to me as well. This has been the process for thousands of years. But spending the extra money for sea salt doesn’t necessarily guarantee you’re getting a better product. It does take some effort to figure all this out, but from what I’ve learned, Celtic Sea Salt is harvested by salt farmers (paludiers) in one of the most pristine coastal regions of France. It contains trace elements that are refined out of table salt and the company states that they also test for heavy metals which can be a problem with some sea salts depending on the area where the salt is harvested. Celtic Sea Salt lab results (under FAO/WHO Codex standards) state there were no detectable levels of arsenic, cadmium, or mercury in their products, which is definitely a good thing. Whichever salt you use to season your food, use in moderation and try adding various herbs and spices to enhance flavors. Be creative and have fun playing with your food! I go back and forth about oats, but I’ve been giving Bob’s Red Mill Gluten Free Oats (whole grain rolled oats) a try. This is my second attempt at eating oats and these pancakes didn’t bother me at all, but the oats didn’t amount to much. On my prior post on oats, I gave you the current thoughts on adding them into your diet if you have celiac disease. There is some controversy surrounding oats, but most experts feel gluten-free, uncontaminated oats are safe for people with celiac disease. They should be introduced slowly, in small doses, and need to be from an uncontaminated source. 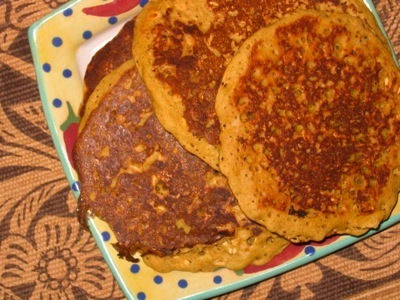 This recipe, which I adapted from one on the Ancient Harvest organic quinoa flour package, only has 1/3 cup of oats spread out among 7 or 8 pancakes, so in reality, I probably ate a tablespoon’s worth. Maybe less. No repercussions and it was a treat to have hearty pancakes. You could easily adjust the recipe to skip the oats. Before I post the instructions, I’ll give you a run-down of the nutritional “oomph” of quinoa. Good, good stuff. The Incas referred to quinoa (pronounced keen-wah) as “chisaya mama” or the “mother of all grains” because of its ability to keep their armies strong. They considered it a sacred food and were on the right track. Quinoa is a power-packed, complete protein – balanced with all the essential amino acids we can’t make on our own and higher in quality protein than any other grain. It will definitely give you a boost in power yoga and is perfect for healing sore muscles after a day of hiking or skiing. Quinoa is also loaded with fiber and is high in vitamin E, iron, zinc, phosphorus, calcium, and magnesium. It has a slightly sweet and nutty taste and is botanically similar to Swiss chard and beets rather than being a true grain. Both the whole grain and the flour are nice additions to your gluten-free pantry. P.S. As soon as I make and get a picture of my quinoa tostadas, I’ll post that as well. Quinoa and amaranth are two of my favorite flours and grains to cook/bake with. Wheat may be the “staff of life” for some, but it’s the “kiss of death” for those of us with celiac disease. And once you start trying to avoid it, you realize it’s everywhere. EVERYWHERE! According to Wikipedia, the free online encyclopedia, “In 1997, global per capita wheat consumption was 101 kg, with the highest per capita consumption (623 kg) found in Denmark.” Can that be right? Per capita (everyone on the planet) consumes an average of 222 pounds of wheat per year? How can that be? I suppose if you eat a bowl of Wheaties every morning, then have a couple of donuts during your morning break, follow it up with a sandwich at lunch, a handful of cookies in the afternoon, and a plate of pasta for dinner, you could rack up those kilograms fairly quickly. But my gosh, 222 pounds per person per year! And what’s with the Danes? 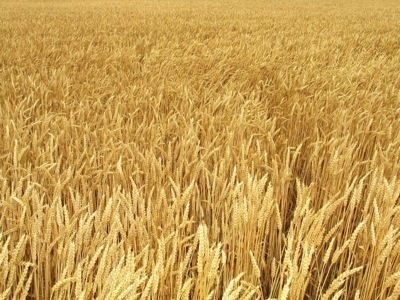 In 2005 (again, according to Wikipedia), annual wheat production was 626 million metric tons. MILLION! Since I haven’t eaten wheat for years and spend a good deal of my time trying to avoid it, I’m having some trouble processing these numbers. And if global consumption is per capita, who’s eating my 222 pounds? The same thing probably applies to most of you reading this blog since it is called glutenfreeforgood. Who’s eating your portion? Now, let’s consider how much gluten is too much if you have celiac disease. Sometimes it’s either impossible to avoid, or you decide you just plain can’t live without that piece of birthday cake. Research indicates that ingesting 100 milligrams of gluten a day will continue to cause intestinal damage in people with celiac disease. Studies from Finland suggest the “safe” amount that may be consumed per day to be around 30 milligrams. How much is 30 milligrams you ask? Less than ONE teaspoon of that birthday cake you’ve been coveting! To put this in perspective, one sandwich contains about 3000 to 4000 milligrams of gluten. (Peter HR Green; Celiac Disease: A Hidden Epidemic; HarperCollins 2006). Wow, I wonder how many milligrams of gluten are in that 222 pounds of wheat eaten per capita each year? Having said all that, aren’t we lucky to have this wonderful abundance of “alternative” grains to experiment with? I made quinoa tostadas topped with chicken and veggie salad last night for dinner. It was wonderful, much better than any wheat or corn tostada I’ve ever had. Plus, quinoa is incredibly healthy, much higher in nutritional value than wheat. No wheat? No worries. Sort of anyway. Before I launch into my post for today, I want to let you know that I’m aware of the computer glitches that are occurring on my site and am in the process of figuring all that out. I have a Mac and am using Apple software to create the website and blog myself and apparently things don’t look quite the same on a PC (pictures may be missing, the formating is off, etc.). I’m also aware, thanks to two sweet, friendly, and experienced GF bloggers (Cindy at Cindalou’s Kitchen Blues and Seamaiden at Book of Yum), that the URL situation I’m dealing with isn’t working that great either. So please hang in there with me and I’ll keep posting recipes, nutritional information, and health tips while ironing out my technical difficulties. HELP! Okay, back to the point of all this, which is to share in a healthy, nutritious, active, and fun gluten-free lifestyle. Like the Beatles so aptly sang, I get by with a little help from my friends. Going to try with a little help from my friends. Don’t we all need a little help from time to time? And part of “getting by” on this GF journey is sharing ideas, recipes, survival tips, humor, and creativity with each other. This is a wonderful little subculture; a cyber community that links us all together, even if we’ve never “officially” met. I love it! Organic. Is it worth the money? I briefly touched on this a couple of days ago in my “lots about lettuce” post, which (drats) was missing the second picture if you viewed the post from a PC. I’m a fan of organic food and from what I’ve read, most of the time there is a difference in the nutritional value, not to mention the avoidance of pesticides and the effect on the environment. A National Academy of Sciences study stated that, “Low level pesticide exposure can cause serious, developmental risks to infants and children, some with lifelong consequences.” Also, for those of us dealing with digestive conditions such as celiac disease, avoiding pesticide exposure whenever possible is a good thing; less junk for our hard-working livers to deal with. At least try to minimize exposure by choosing organic when purchasing the following fruits and vegetables (the first list below). These have been labeled the “Dirty Dozen” by the Environmental Working Group after running over 50,000 tests for pesticides on produce collected between 2000 and 2005. If you can’t opt for organic in all your food choices, try to make your conventional choices from the “Cleanest 12” and your organic choices from the “Dirty Dozen” list. I eat a big salad almost every day during the summer. Salads make a great meal when you crave something light, yet healthy and filling. “Light” and “filling” can go together and a salad can be served for breakfast, lunch, or dinner; it doesn’t matter. Who decided breakfast was pancakes, lunch a sandwich, and dinner pizza, anyway? Obviously not someone with celiac or a gluten intolerance. *See the final version and my favorite salad dressing recipe below. Why dedicate an entire blog entry to lettuce, you ask? What’s there to say? Other than it makes for good rabbit food. Lots! First off, I get my lettuce from a wonderful local organic source called Grant Family Farms. The Grant family has been growing organic vegetables for the past 25 years and were the first to be certified organic in the state of Colorado. They’re also a CSA designated system, of which I plan to apply to be part of for the next growing season. Right now I’m getting Grant Farms produce at my local health food market. What is CSA? “A CSA is an innovative and resourceful strategy to create a straightforward partnership that brings together community members, farmers and agricultural land into a relationship of support. The CSA system provides a direct link and responsible relationship between people and the food they eat, the land upon which it is grown and those who grow it. Based on an annual commitment to one another, community members provide a pre-season payment to purchase a “share” of the season’s harvest. 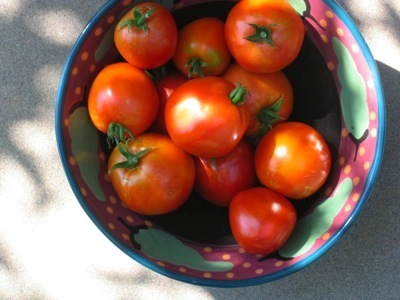 The member then receives a weekly box of a wide variety of fresh produce through the growing season, harvested at the peak of ripeness and flavor.” Grant Family Farm website. The scientific name for lettuce is Lactuca sativa, which is derived from the Latin word, lactuca, which means milk. When you break apart a piece of lettuce from most varieties, a slightly bitter, milky substance is released, hence the name. The variety in the photo I took above is “loose leaf” lettuce. It is the best known version and includes green and red leaf lettuce. I also have a little Chinese cabbage thrown in to the mix (the very light colored leaves). That makes for a good blend of nutrients to start from. That was my launching pad, see final product below. In general, the darker the leaves, the higher the nutritional content. Iceberg is the lowest on the totem pole. Reach for the dark green and red varieties. Romaine and loose leaf provide LOTS of vitamin K, vitamin A, vitamin C, folate, manganese, chromium, potassium, and fiber. 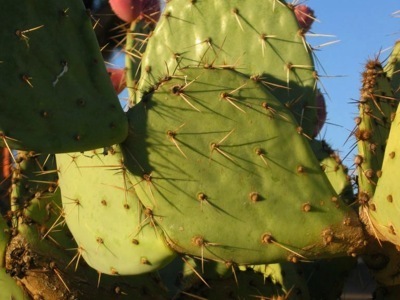 They also carry a good share of thiamin (vitamin B1), iron, riboflavin (vitamin B2), phosphorus, and calcium. And a decent amount of protein (surprise), omega 3s (surprise again), tryptophan, niacin (vitamin B3), and pyridoxine (vitamin B6). And all for a measly 15 calories for 2 cups. 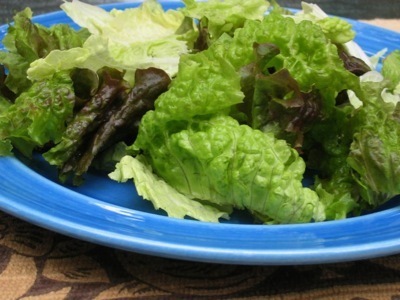 Wow, you just can’t go wrong with a good heaping plate of lettuce. Of course you need to top it with all sorts of good things; the more diverse the better. No need to stick with plain old tomatoes and carrots. Not that you shouldn’t include those, but be daring and try whatever you have around. 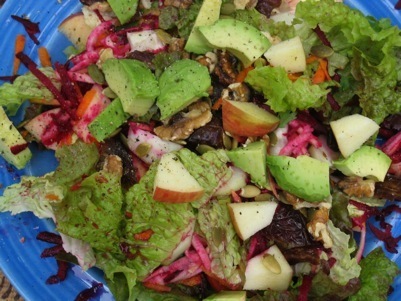 Plums, pineapple, shredded raw beets, shredded raw squash, dates, seeds, nuts, cooked rice, jicama, avocado, cranberries, cabbage, apples; whatever comes to mind. Pile it on! Choose organic when it comes to lettuce. 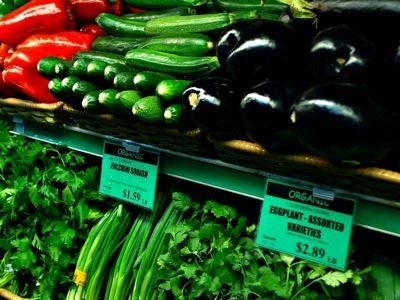 It’s on the Environmental Working Groups list of the “Dirty Dozen” fruits and vegetables. YIKES! Lettuce came up with all kinds of nasty numbers. Check out the Complete Data Set of rankings from worst to best. Maybe lettuce should be one of your organic choices. This is the “after” photo of my lettuce launching pad. The dressing is one I made up and my absolute favorite. And it works on everything and is healthy! Yippee! If you’ve been following this blog, you know I’ve been roasting, peeling, and eating green chile for the past two weeks. I promised I’d quit posting different versions of green chile and while this recipe has nothing to do with that, it was inspired by tortilla testing for future green chile eating. I’ve been trying to come up with a tortilla comparable to the kind made with white flour and lard, which is totally disgusting when you break it down nutritionally, but not bad when you roll it up and dip it into a bowl of green chile stew. Traditional tortilla ingredients are either devoid of nutritional value or off limits because of the gluten, so I’ve been experimenting with different flours in an attempt to create a healthy, tasty, and dip-satisfying tortilla. Gluten-free and dairy-free no less. This attempt worked okay, but it’s a far cry from a tortilla, so I’ll call it flat bread. It makes for a healthy and interesting sandwich holder. Hey, when you have celiac disease your bread standards change and you have to be creative (not to mention have a good sense of humor). 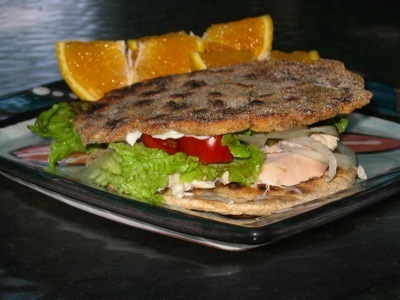 This flat bread also makes a good cracker to spread salmon salad, almond butter or guacamole on. Break it up in chunks and serve on a platter with a yummy and spreadable concoction. Not bad! I’ve tweaked the recipe and tried it several times now and it seems to come out better with each attempt. I think it’s more about gaining rolling pin dexterity and coordination than actual changes in the recipe. It’s not easy to shuffle that little ball of sticky dough around and flatten it out without the whole thing rolling around the pin. Or cementing itself to the counter. The recipe is simple, the execution of it takes culinary motor skills. First, a little background on amaranth. Amaranth is quinoa’s cousin. They’re similar in the fact that both contain all the essential amino acids and are considered excellent and complete protein choices. Like quinoa, amaranth is incredibly versatile and is high in fiber, calcium, phosphorus, iron, B vitamins, and vitamin E. Amaranth is actually higher in protein and calcium than milk, so those of you (me too) who are dairy intolerant, take note. It also contains an important calcium cofactor, magnesium. It’s very good stuff! It has a nutty, herbal, earthy taste, which I love, but it might take some getting used to if you’ve been stuck in the refined, wheat flour rut. You can mix a little of the whole grain in with rice or quinoa (or any grain) to add a delicate crunch to your dish, or cook it up and mix in some agave, apple chunks, and nuts for a yummy breakfast porridge. It releases a form of starch called amylopectin while cooking, which gives a creamy feel to it (kind of like risotto). Amaranth flour provides some leavening properties while baking, so it’s a good choice for those of us who avoid gluten. If you have any leftovers or you make a bigger batch, store in the refrigerator and heat in the toaster. Enjoy! P.S. Although I haven’t tried it yet, the Bob’s Red Mill amaranth flour package has a pancake recipe on the back that looks so good. Yum!